All the following details relate to a Singer 323, obviously things differ from model to model so use caution and common sense. A couple of different-sized screwdrivers (medium – small ones – I had one of those sets of small ones, plus a regular-sized one). A magnetized screwdriver helps to ‘pick up’ little screws when you’re taking them out of little places, without them getting lost deeper in the machine. We magnetized a regular screwdriver by running a fridge magnet over the tip a few times. Lubricant – I used Inox-MX3. You could also use gun oil (?). Don’t use WD40, apparently it gums up over time. Pen, paper and double-sided sticky tape. 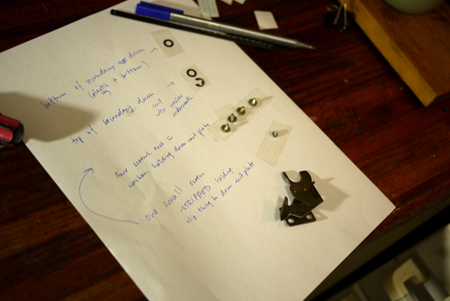 For sticking screws on, and making notes about where they came from. A hacksaw, to saw a new groove in a stripped screwhead (this was frustrating, I hope it doesn’t happen to you). You probably won’t need the wrench and extra screwdriver you see in that photo above. This video nicely shows how to take the plastic cover off the carriage – it’s shown on a different model from mine so a couple of things are in different places, but with common sense it wasn’t too hard to figure out. You don’t need to unscrew the screws that you see “through” the holes where the handles connect – they’re part of the deeper workings, not the cover. Once that was off, R and I had a good poke around and decided that yes, it was the secondary drum that was stuck (some people call it the sub-drum). To remove the primary and secondary drums, we mostly followed the instructions in this helpful post by Ravelry user Elizabethruns, in the Aussie Machine Knitters discussion board. Again, it took a bit more commonsense-figuring and examining to figure out, but basically is as follows.. The primary and secondary drums are both attached to a single metal plate (let’s call it the “drum plate”), which is attached to the carriage bed by four screws. Remove the screws, remove the whole plate with both drums attached. 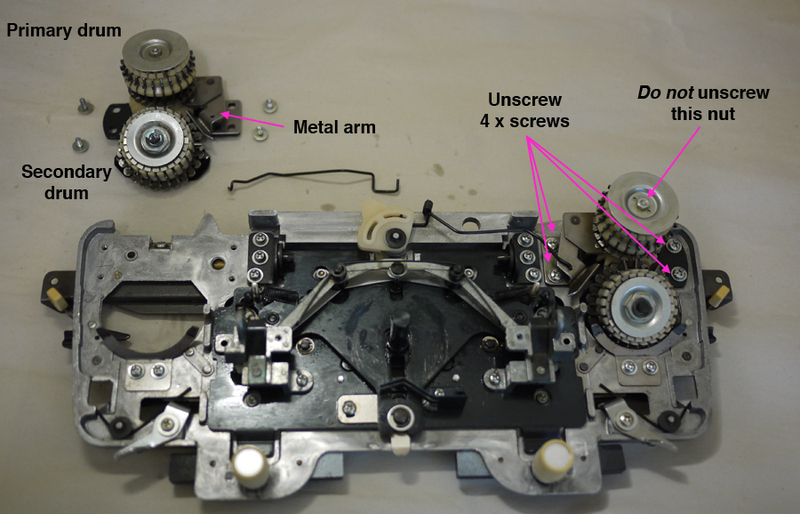 There’s a metal “arm” which sits in with the main drum, this arm is attached to the drum plate by a single screw. Remove the screw & set aside the arm. There’s a clip on the top of secondary drum, which you’ll need to remove. It’s sort of C-shaped – use a screwdriver stuck into the curve of the C to lever it off. After taking the clip off, take off the metal washer underneath and set aside. You should now be able to pull off the main drum and the secondary drum. It may take a bit of leverage – on mine the secondary drum was really stuck, with a bit of wiggling and pulling it came off. There’s a metal washer at the bottom of the secondary drum, remove it and set aside. Lubricate with Inox-MX3 or gun oil. Don’t use WD40, apparently it works short term but can gunk up and damage your machine long-term. Most on the Ravelry Aussie Machine Knitters group recommend Inox. Replace the outer plastic cover – squeeze the front corners of the outer plastic cover to get those little plastic hooks into the bit on the metal frame where they go. NB: Don’t screw the cover in now – wait until a few steps on when the cam lever and tension dial are in place & turning properly before you screw the plastic down, it took me a couple of goes to get them in right. Before you replace the inner plastic cover, make sure that the black triangular-ish plate that sits kind of “on top” in the middle of the carriage (see pic below) is pushed as far forward as it can go. 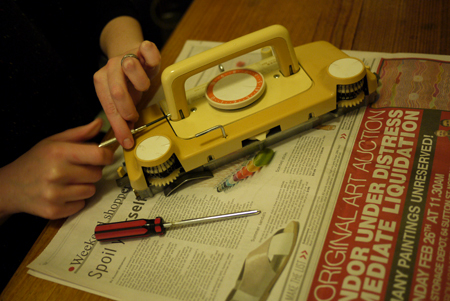 It has to be forward to get the tension dial on later (guess how I know that). Fit the cam lever into the plastic cover – there’s a metal bit that tucks under the plastic cover. 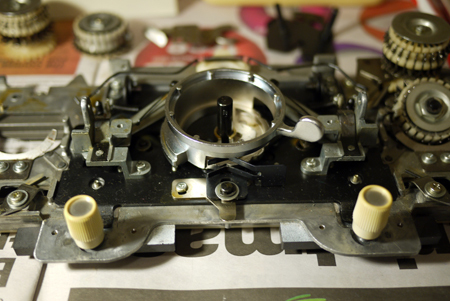 At the front of where the cam lever sits, there’s a black metal lever-ish spring thing, with two prongs. The BOTTOM prong should sit in the little ‘V’ grooves around the cam lever ring – the picture below shows what it would look like without the inner plastic cover. Make sure the cam ring gets past the top prong and all the way down. 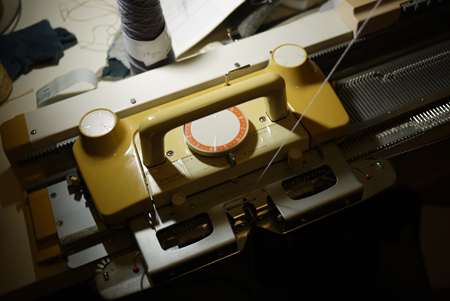 Make sure the lever can move around to all the positions (from ‘tuck’ through to ‘knit-in’). Replace tension dial – the tension dial sits inside the cam lever ring. Align the dial with the space between 0 and 10 to the front (the same way you took it off – it will only work one way), and push it in. 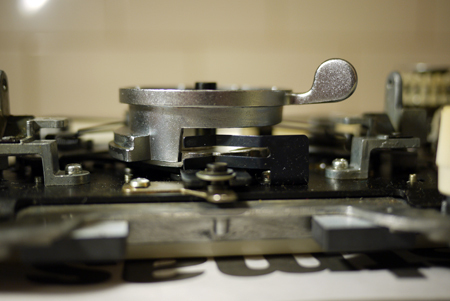 The TOP black prong inside the carriage at the front sits in the grooves around the bottom of the tension dial. Make sure the tension dial turns easily and ‘clicks’ into each tension setting. Screw the plastic cover back on, and screw the handle back in. DONE! Now you have a clean, happy carriage. This entry was posted on Thursday, November 22nd, 2012 at 9:14 pm and is filed under machine knitting. You can follow any responses to this entry through the RSS 2.0 feed. You can skip to the end and leave a response. Pinging is currently not allowed. Thanks Kate, I now have 2 clean carriages. Thanks ever so much for posting, I have a Singer 155 and I think the one of the drums isn’t working, I will have to try this and hopefully it will help. Good luck Pam! Seems like every model is a bit different but I’m sure you’ll be fine – common sense and careful labelling of screws & parts got me through the confusing bits. This has been so helpful, thank you. My lace carriage drums are frozen. One side now done after reading this. Still having trouble getting the other side off. have a screw that is rounded off. My husband is going to try and drill it out. Glad to hear it’s been helpful … I had trouble with a couple of screws too – perhaps because they’re old? Not sure, but I persisted and were ok, hope yours worked too. It did Kate. I ordered new screws and got my husband to drill out the old one. Have blogged about it. It is finally working correctly. There were many mishaps along the way but finally got it working OK. Put a link to your post in my blog so that others could benefit. Hope you don’t mind. If you do let me know and I will remove it. How frustrating… Do you have a local machine knitting group you can ask? I don’t know anything about the studio 155 I’m afraid… good luck! 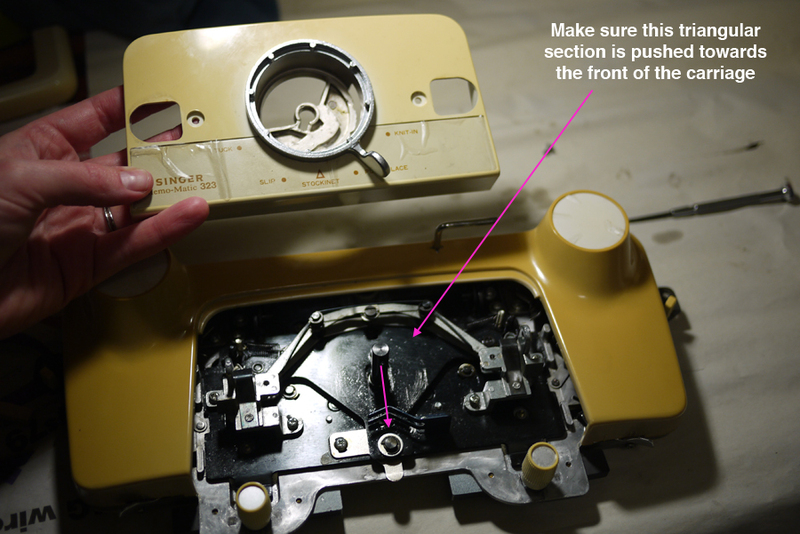 I just acquired a Knitmaster F370/270 and the right hand main drum is frozen. After a lot of net trawling I found this post. Thank you so much, I thought I’d wasted my time and money but I now have hope. Thank you. I have two carriages to fix. this will help in some of the methods needed. 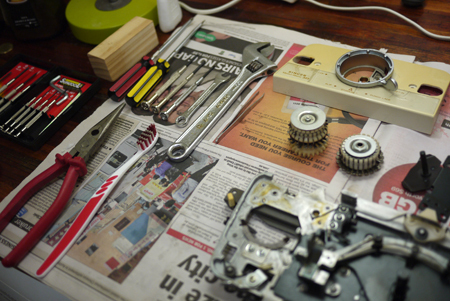 One is a very old singer 200D – I know the problem and how to fix it but cannot remove the the cover (mostly metal not plastic) – working up courage to attempt. Maybe someone knows how to gain access to the inside? It was working beautifully one day and the next it had stopped – a little spring had come undone – only have to replace it but cannot access it. Happy to get some feedback.